Former St. Louis Cardinals manager Tony La Russa left one of his World Series rings in a baseball glove after a first pitch before a Boston Red Sox game. [post_ads]Red Sox pitcher Joe Kelly posted a photo of his glove Friday on Twitter, showing the ring inside. La Russa used Kelly's glove to catch the ceremonial offering before the Red Sox beat the New York Yankees 15-7 on Thursday at Fenway Park in Boston. He caught the toss from Roland Hemond. "Hey Tony La Russa," Kelly tweeted. "I might have something you are looking for. Thanks for using my glove during the first pitch ceremony. #finderskeepers #findersfee #trilliondollars." 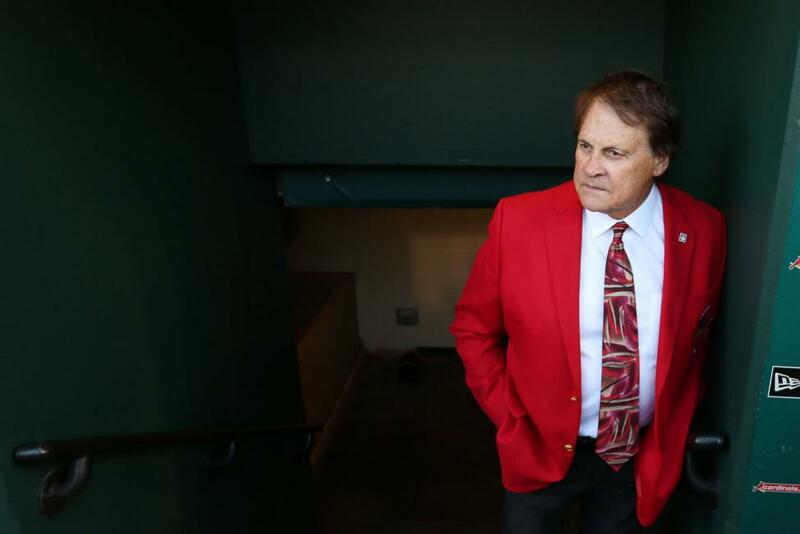 La Russa, 73, was a three-time World Series champion and a four-time Manager of the Year during his 33 year tenure as a Major League Baseball manager. He spent 16 seasons with the Cardinals, 10 seasons with the Oakland Athletics and eight seasons with the Chicago White Sox. He led the Cardinals to a World Series in his final season in 2011, beating the Texas Rangers in seven games. La Russa was inducted into the Hall of Fame in 2014 as a manager.